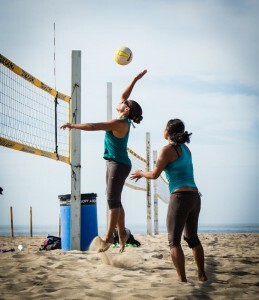 Beach volleyball setting is a skill that takes lots of practice and repetition to master. Even the most experienced indoor setter will need to learn how to make the necessary adjustments to be a good setter on the sand. 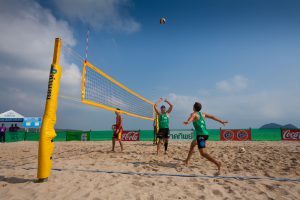 Three basic fundamentals of setting on the beach are: approaching the ball, squaring up, and setting the ball straight up and down. On the beach, the player who is not receiving the serve automatically becomes the setter. Unlike indoor, the setter does not run right up to the net. Instead, the setter releases a few steps forward when their partner receives the serve. The setter waits in a neutral zone for their partner to pass the ball forward. The passer should keep the ball between themselves and the setter, leading the setter to a spot where they can easily approach and set through the ball. This approach helps the setter prepare to square up and deliver an accurate set. Squaring up to set a ball on the beach is crucial. After one partner passes the ball forward, the setter should come in at an angle and get their feet to the ball. Their belly button should be facing the area where they want to set the ball. Not only is this important for making a consistent, up and down set, it actually helps the hitter know where the ball is going to be set so they can prepare to come in and attack. Another beach volleyball setting tip to help avoid setting the ball too close to the net, or over the net, is to position the foot closest to the net slightly in front of the outside foot. Once the setter is squared up, they can choose to either hand set or bump set the volleyball. Both of these sets require using the arms and legs together. On the beach, hand setting requirements are more strictly enforced than indoor. Indoor players tend to take the ball higher when they set, using their fingers and flicking their wrists for a quick release. On the beach, the ball is cradled a little deeper, almost like being held in a basket. This is called the deep dish technique, with the wrists back and the arms extended. This technique helps the ball release without spinning. For a bump set, the setter should use their arms and legs equally so the ball can come off the platform and go straight up with a good apex. Sometimes the setter will use their arms more; if they have tired legs or cannot get their feet to the ball. Sometimes the setter will use their legs more; if the pass is tight and they cannot move their arms without netting. Most of the time, the setter should try to use the arms and legs equally to keep the sets smooth and consistent. Applying these three fundamentals of beach volleyball setting will increase options on offense. With time and practice, players will be able to set the ball with greater range, rather than just the normal up and down set. Being able to set the ball a variety of distances and heights will be an advantage because the opposing blocker will be thrown off their mark. When the setter becomes really advanced, they will be able to make an accurate set, and then look across the net and tell their partner where to hit. All of these aspects of setting on the beach make it exciting and challenging for anyone willing to learn.